A raw hem and a painted look, this jean jacket brings a fresh layer to your basic ensembles. So when you don't have the perfect top, you'll still look beautiful in the perfect jacket. 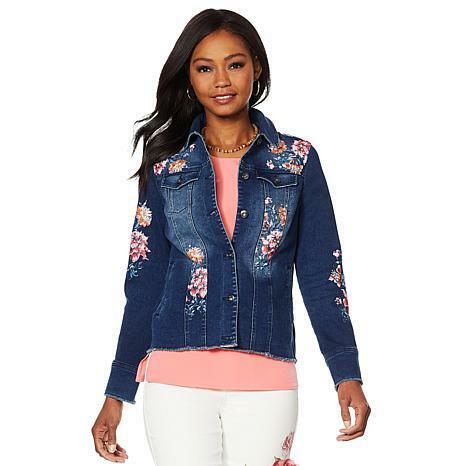 This jacket fits perfectly, has all the Spring design you need for the coming seasons and is just adorable. BTW, it washed great!Thanks, Diane, once again, for being fabulous! I bought it in white. I bought this jacket in denim and also in white. Love both. The stretch is awesome as is the fit. I love the flowers, I only wish they were embroidered instead of painted on. Im hoping they stay put and dont wash off in the future. I seldom return Dg2 items. However, this jacket was scratchy and the fabric was stiff. I particularly didnt like the painted flowers. I would have preferred embroidery. Ordered the white and it fit very well but I am so spoiled with the real embroidery on my jeans that the "painted on" flowers of the jacket just don't compare. It has been returned. I got the white in the XS, it was still too big, im convinced her line runs big in general, Ive had to return anything I purchased so this was the last try. But the jacket was very very stiff and the sleeves are ridiculous, they are unfinished but if you cuff them they stick out and look silly.